Bone grafts consist of three basic types. The socket that holds a tooth is made up of a type of bone that exists solely for that purpose. Called alveolar bone, it begins to resorb back into the body as soon as a tooth is extracted. In many cases, dental extractions precede dental implants by a period of months because a tooth socket is infected or too large in diameter to accept an implant. A ridge preservation graft, typically made of granulated, freeze-dried sterile bone from a human or animal donor, helps maintain the socket until the implant can be placed. The graft material consolidates into the bone in three to six months. In some situations, a patient requires a graft with more mass than the material used in ridge preservation can deliver. 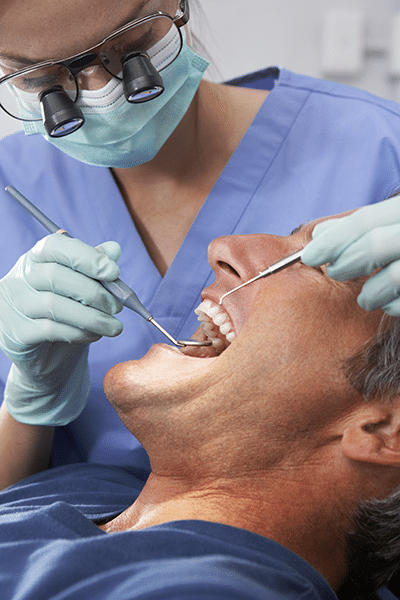 This occurs when an extraction isn’t followed immediately with an implant or a socket graft. It also happens when a tooth is missing because disease or trauma destroyed the bone, or because the tooth—and therefore the supporting bone—never developed. In these cases, the block-shaped graft of the patient’s own bone comes from the chin, or the lower jaw where wisdom teeth had been removed. Held in place with tiny screws, the graft fuses with the jawbone over the course of about four months, forming an area that can support an implant. On each side of the nose, the upper jaw includes a sinus that can intrude into the space that should contain dental roots. These sinuses can interfere with the placement of implants in the back of the upper jaw. A subantral graft opens a window into the sinus, creating an area to fill with grafting material. After six to nine months, this material becomes part of the upper jaw and makes it possible to insert an implant. Depending on how much bone is present before a subantral grafting procedure, the implant may be inserted at the same time as the graft.